While not John Carepenter’s best movie, “The Fog” is an atmospheric ghost story that delivers a few good chills. We can’t expect our beloved horror movies from the 70’s and 80’s to hold up forever, and “The Fog” has become a little dated over time. 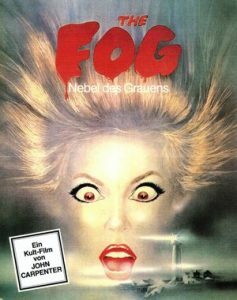 “The Fog” is very scenic and has a great ensemble cast including Adrienne Barbeau, Jamie Lee Curtis, Janet Leigh (Jamie’s real life mother), and a small cameo by John Houseman… just to name a few. I particularly liked the premise of Jamie Lee Curtis’s character Elizabeth Solley, a solo hitchhiker on her way to Vancouver who gets picked up by local resident Nick Castle (Tom Atkins), sleeps with him the first night they meet, and then never leaves his side through the rest of the movie as the terror of “The Fog” unfolds. Boy, you just HAVE to love the 80’s!!! The small coastal town of Antonio Bay is celebrating it’s 100 year anniversary. However, also 100 years ago a ship sailed along its shores and a curse was born. Unbeknownst to the new residents, the sailors of that vessel have come back, walking through the nightly glowing fog to kill and avenge the loss of the treasure that was stolen from them. I won’t say more as not to give the movie away. For nostalgic purposes, this film is definitely worth a viewing. If it’s been a very long time since you’ve watched “The Fog” and you don’t remember it all too well (as was the case with me) it’s worth a second look indeed. “The Fog” is not bloodbath/slasher horror, but it does make for a good spooky late night film. With the current remake currently in production and to be released by 10-05, what better time to revisit the original! !